Reno, Nev. — Preliminary data from an aerial population survey conducted by the Bureau of Land Management (BLM) and the U.S. Fish and Wildlife Service (FWS) of northwest Nevada and southern Oregon indicates there is a minimum of 4,200 wild/feral horses within this area, which contains 13 wild horse herd management areas (HMAs), including the five Calico Mountains Complex HMAs, 3 wild horse herd areas (HAs), and two national wildlife refuges. The BLM and FWS concluded the inventory on June 28 after nine days and approximately 60 hours of flight time using a fixed-wing airplane, which will provide a scientifically-based estimate of the wild/feral horse population. The project area encompasses approximately four million acres of private and Federally-managed public lands. This improved population survey methodology was developed by the U.S. Geological Survey (USGS) with the assistance of BLM wild horse specialists. The methodology, called Simultaneous Double-Count with Sightability Bias Correction, used three observers to independently observe and record data on groups of individual horses. The methodology incorporates peer-reviewed techniques that have been used for decades to estimate wildlife populations around the world. A statistician cooperating with USGS will analyze the preliminary data obtained during the inventory flights to provide population estimates with a 95 percent confidence interval. Inventory information relies on the ability of the aerial observers to see horse groups and is strongly dependent on the skill of the individual observer, size of the horse group, and vegetation cover. The modeling and analysis to be completed will make adjustments to the preliminary data to account for animals not observed during the flight. The simultaneous double-count/sightability bias correction technique will provide more valid population estimates than the standard uncorrected aerial inventory method. While the BLM does not have a date for the release of the final results of the inventory and necessary modeling work, preliminary data, which represent the minimum number of horses in each area, are shown below. The BLM/FWS will release the results of the analysis to the public when it comes available. The following numbers shown are direct counts of animals seen during the flight and include observed foals of the year. This cooperative effort will establish a base line population count and animal distribution in this large area. Past population surveys and gather operations have shown that wild/feral horses may move among a number of HMAs and the Sheldon and Hart Mountain National Wildlife Refuges. This population survey represents a point in time and that because of the free-roaming nature of the animals their movement between HMAs is normal and expected. While the total number of animals is expected to remain stable until next year’s foaling season, the numbers within each HMA will vary over time. Pre-determined transects spaced 1 ½ miles apart were flown at an altitude of approximately 500 feet above ground level and speeds ranging between 95 and 110 nautical mph. Data collected included the number of horses per group, type of topography, plant cover, activity of the horses, and other parameters that will be used to develop population estimates. All observed horse groups also had their locations recorded via GPS. BLM and FWS are planning to return to the area later this fall for a second survey that will provide information on the herd movement and how that can affect population counts in the individual areas. Map of survey area and locations where horses were observed. 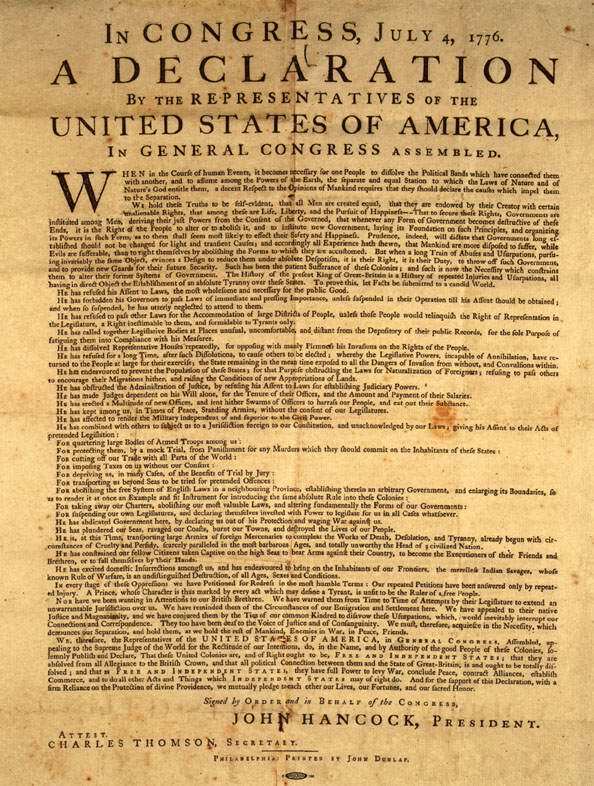 How many of those among us have actually read and understood the document now known as the Declaration of Independence? Any of us who have made it through middle school grade levels know what the text of the document is; most of us had to memorize the first few paragraphs for a test grade. But how many of us actually understand the text and words? I began this post early this morning. Needless to say, I got a little bit sidetracked. However, following the white rabbit down the bunny trail has led me to a new and awe-inspiring understanding of this great document. I wonder now if Thomas Jefferson knew then while he sat by candle light with a quill and ink pot just how much his humble and yet powerful words on a piece of parchment paper would affect the American people. Certainly, he did not know then what I know now of how it so accurately applies to the plight of the American Wild Mustang and Burro. It has been said that Thomas Jefferson wrote the Declaration in a format that was intended to be performed, as in acted out. After coming upon this discovery today, I would have to agree with this wholeheartedly. I ask that you follow with me on a trip to the imagination: As you listen to the following reading, think of the Colonial Americans… Then think of them as the American Wild Mustang. Don’t stop paying attention once you hear the first few paragraphs that we’ve all heard a million times. The truths come after them. As I stated, I started this post early this morning in order to pull a few more resources together for a slide show / video showcasing the Equine contributions to the American Military. It is greatly shadowed by the light of the video above but I like it LOL. The following are wild horse and burro gathers that are proposed to be conducted this summer. This list is up to date through June 22, 2010. In November 2008 I was at a meeting where a rather influential person in the anti-horse camp was lamenting that the horse advocates were making headway because of their use of the internet. “If something happened, within 24 hours these people will have 5,000 emails and letters sent out to politicians.” The point of this little speech was that the anti-horse folks had learned their lesson and were going to use the internet for their own advantage. To make a long story short the people who want to get rid of wild horses have been getting organized. They are bringing everyone of common interest into their fold. They have developed action alert networks so they can also generate an instant flood of emails and letters. Some of these people have also carefully analyzed our camp and have identified our weaknesses and they are taking advantage of our weaknesses. We have not been evolving at the same rate as they have and our advantage in this battle is eroding. One of the most effective tools used by the other side is misdirection. These people are primarily motivated by profits. Profits (and losses) tend to keep people focused. The motivation of the wild horse advocacy camp is more esoteric and therefore is more easily manipulated. I tell ya… In my opinion – for what it’s worth LOL – I have to say that you all here on TMP’s Blog are just about the smartest bunch of folks I have had the pleasure of “bouncing” with. Bouncing is a term used here around my nek-o’-da-woods that we use when we have a brain-storming session or bounce ideas off of each other to find better solutions. It’s even funnier when we get that solution because we tend to bounce like Tigger! Seriously, you guys are more than I could have hoped for when I started this whole crazy thing. You think outside of the box; you don’t let your convictions waiver; and you dang well know how to look past the first two lines in a document to find the most important info. And what’s more, you are all bigger and better than to let the concept of playing on your emotions rather than your own intelligence make your decisions for you. I am so very proud to be friends and advocates alongside each of you. Lord knows, I couldn’t have done any of this by myself, and I certainly wouldn’t have come into so much knowledge and information as I have since bouncing with you guys. So from the bottom of my litl’ ole pea pickin’ heart and for the horses and burros, much obliged to each of you! Matt, the work you do is invaluable. The accuracy and truthfulness with which you conduct your research is priceless, to say the least. Without your efforts, there are so many pieces of information, knowledge, and education that we would not have had so easily. Your ability to convey the bottom line of a subject is simply uncanny sometimes. Thank you graciously for all of your hard work, long nights, and patience! I think above all else, I have to thank you for showing me the “rest of the story” when I first became involved. I have always trusted your guidance, and it has never let me down. Friends like you are hard to find. I’m glad that I have been so fortunate. Tentative Gather Schedule FY 2010 (pdf) – Where, when, how many, and has the corresponding field office to each scheduled gather hyperlinked in the right column. As well, the title is hyperlinked to the Nat. WH&B webpage where this information is updated & the Completed Gather Statistics webpage hyperlinked at the bottom of the page. Note: For informational purposes ONLY. This schedule was copied from the National Wild Horse & Burro Program’s website and does not reflect prior or subsequent cancellations. I, Tracie Lynn Thompson, do not take any responsibility for any changes that occur to this schedule or for any errors in this schedule. Like I said, just for informational purposes. The main reason for this pdf is because of the embedded links – corresponding field office to each scheduled gather. Washington, DC (February 4, 2010) – The national law firm of Buchanan, Ingersoll & Rooney yesterday notified the U.S. Department of Justice (DOJ) that it intends to sue to stop the Department of Interior Bureau of Land Management (BLM)’s planned roundup of nearly 500 wild horses living in the Eagle Herd Management Area in eastern Nevada. The roundup, scheduled to start in mid-February, would leave just 100 horses behind to roam over 670,000 acres of public land. The following lists the tentatively scheduled gathers starting with Calico and going through to Black Mountain in March 2010. The title is hyperlinked to the BLM webpage where this information can be found. As well, each BLM field office listed in the last column is hyperlinked to that office’s webpage. It might seem like federal regulators are fast-tracking the development of Nevada’s first commercial wind farm. But the 160-megawatt Spring Valley Wind project has actually been in the works for over four years, as the developer gathered additional information sought by the U.S. Bureau of Land Management (BLM). A private contractor is currently putting the finishing touches on the draft Environmental Assessment for the 66-turbine project, which would be located on BLM-administered lands between State Route 893 and U.S. Highway 50 as it veers north toward Sacramento Pass. It might seem like federal regulators are fast-tracking the development of Nevada’s first commercial wind farm. But the 160-megawatt Spring Valley Wind project has actually been in the works for over four years, as the developer gathered additional information sought by the U.S. Bureau of Land Management (BLM). Tuesday, Dec. 29, 2009 | 1:58 p.m. The Bureau of Land Management has guaranteed fast tracked decisions on 24 renewable energy projects and seven transmission lines across the West, including several projects in Nevada.